On Feb. 13, Wesleyan’s Dynamic Women at Wesleyan (Women@Wes) organization hosted a workshop on “Living a Soul-Filled Life by Strengthening Self-Love.” Inspirational speaker Mensimah Shabazz led a meditation and discussion that focused on creative ways of generating self-confidence, fearlessness, and inner wisdom. “One of the ways is strengthening self-love, which enables a person to recognize their uniqueness, beauty, and strength,” she said. 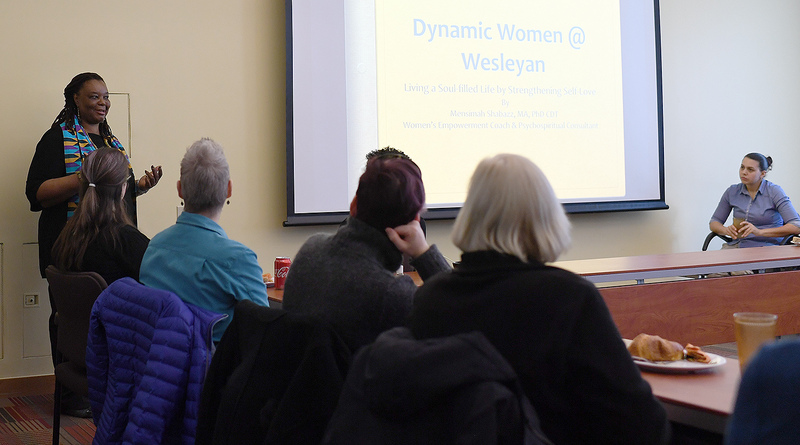 Women at Wesleyan frequently meets to actively engage faculty and staff in education, networking, and mentoring processes leading to enhanced awareness, empowerment, and transformation of women. For more information visit http://womenatwes.site.wesleyan.edu/.